Thanksgiving-themed printable activities, including coloring pages, math worksheets, shape books, writing prompts, word searches, crosswords, and more. Enjoy coloring in the letters on this Happy Thanksgiving eye chart. Provided by VSP Vision Care. 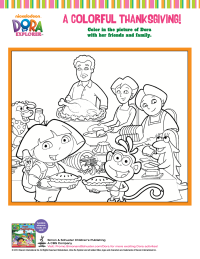 Color in Dora's family in this Dora-themed Thanksgiving printable for young children. Created by Simon and Schuster Resources. Find books about Dora the Explorer. 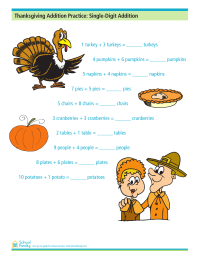 Practice single-digit addition with this Thanksgiving-themed math worksheet. Practice multi-digit division with this Thanksgiving-themed math worksheet.